recipes to a young poet: What would Popeye eat for breakfast? What would Popeye eat for breakfast? "Breakfast is always the same, perfectly reliable, no decisions, no conflicts: orange juice, muesli, a three-minute boiled egg, a slice of buttered toast, coffee that I grind myself. There’s a tiny kitchen on the landing just outside my door, a cooker and a little fridge and a sink. Mr. Sandor uses it before me in the morning, Miss Neap comes after me. Mr. Sandor always leaves the cooker sticky and smelling heavily organic. I don’t know what he has for breakfast. Squid, maybe. Kelp." Turtle Diary is a pleasant novel about two lonely British people who decide to save turtles from the aquarium. Unfortunately, my breakfast is more like William's than Mr. Sandor's most days. Oatmeal with blueberries, cinnamon, flaxseed meal, a smear of crunchy peanut butter, and sometimes a sprinkle of raisins. Not a bad way to start the day. But in a perfect world, I'd eat eggs for breakfast every day. Scallion pancakes dipped egg and then pan-fried. Poached eggs over toasted English muffins. Scrambled eggs with ketchup. Maybe even breakfast soup. 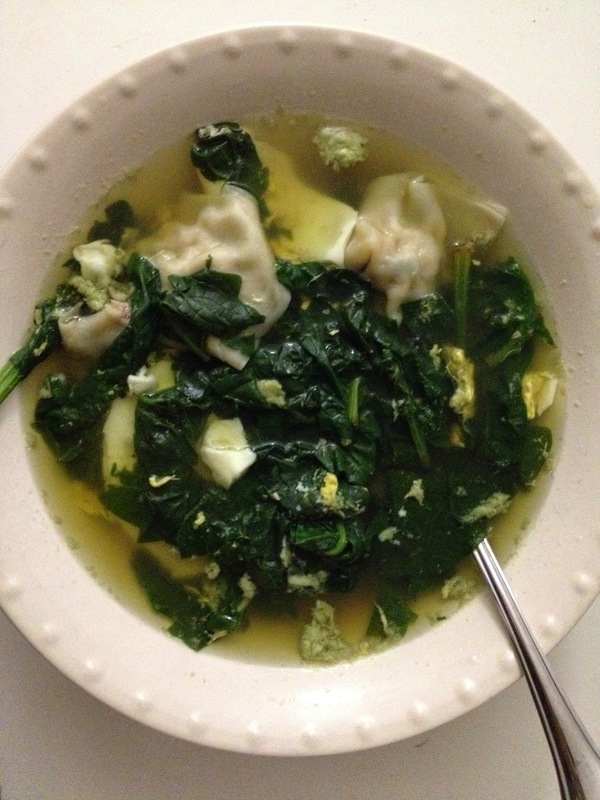 In the above quote, the word "kelp" reminded me of a lovely idea for a savory breakfast: spinach egg drop soup. It couldn't be easier, really. Which is perfect for people who aren't fully awake yet, but still have to try to make breakfast. Heat up a small saucepan with about 3 cups of water. Bring to a boil and add the dashi powder. Pour in the egg and bring to a boil again. Throw in the spinach leaves and stir. Add more salt if necessary. Turn off the heat and serve immediately!